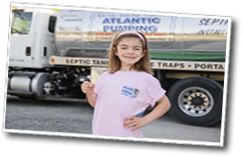 Did you know that your septic tank needs to be cleaned every 2-3 years? Cleaning the septic tank removes solids and sludge, which can exit the tank and enter the drain field, causing it to prematurely fail. Regular cleaning of your septic tank insures your drain field will operate at optimal levels. 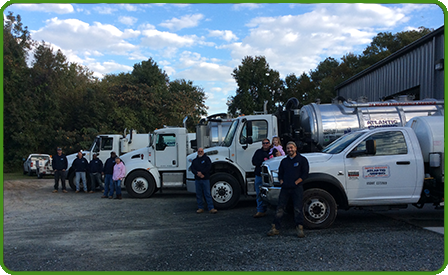 The technicians at Atlantic Pumping, Inc. use the most advanced vacuum and liquid waste handling equipment available. This process insures that the tank is pumped, and most importantly clean. Our service vehicles carry over 250 feet of hose to protect your lawn and landscape. Our trucks are inspected and licensed from the state and local health departments. All wastewater is transported to an authorized wastewater site for proper disposal.